Friday the 27th of November we mad our annual trip to Duncanrig Secondary School in East Kilbride, Scotland. 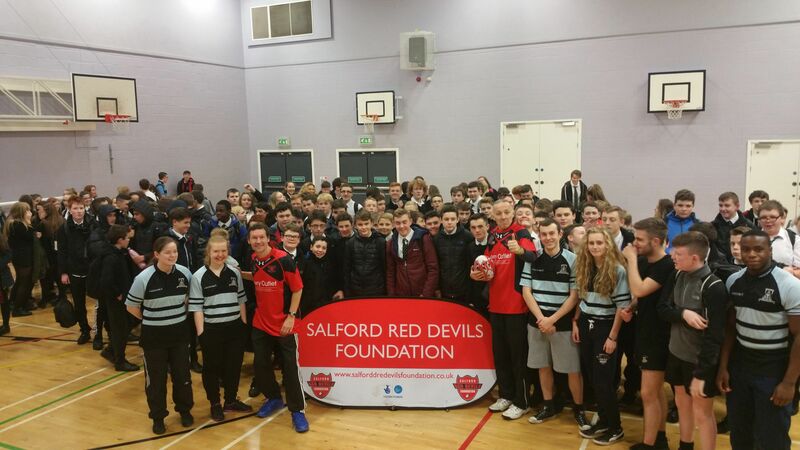 Strengthening our great link with the school and Les Obre who is an avid Salford Red Devils fan all the way from Glasgow. We worked with around 250 participants from all different age groups, both male and female. For some of the participants this gave them their first opportunity to take part in a rugby league training session. We planned a range of different activities and every group had an opportunity to try all three. We then completed our day with three different groups in an after school club. The day was a great success and all the feedback we received was fantastic from both students and staff. "Thank you so much for working with our teams today, it was great for the boys, as it was last year. I think it was genuely inspirational for the girls to get quality coaching from female coaching staff aswell. We cant wait for next year"
We would like to thank Duncanrig School/ students and staff for being so welcoming. Same again next year.